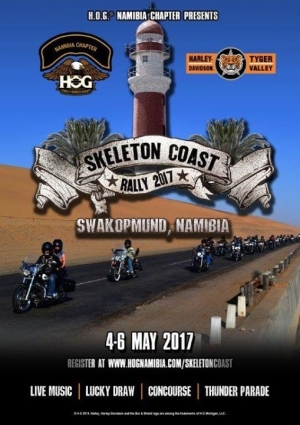 Check into your chosen Swakopmund, Accommodation and get to the S F C, the main Rally Site, to Register for the Event. Meet and greet fellow Riders. There will be several food stalls. 18:00 Dinner served by several food stalls. 17:00 Make your way to the TIGER REEF BEACH BAR for our farewell party with free Namibian Braaivleis and live music. 08:00 - 8:30 Open air, ride in, Church Service with Rev Piet on the Grass Soccer Field . SFC.